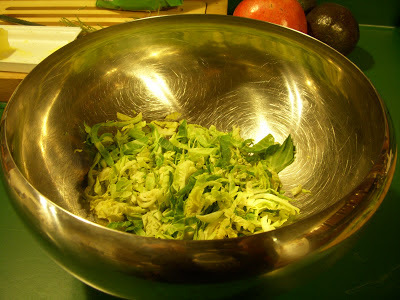 "Shredded Brussels sprouts salad" almost sounds like a bona fide tongue twister, but even if you cannot say that quickly (over and over again), even if you never have liked eating Brussels sprouts and still think you won't like them, I almost guarantee that you will eat this salad with enjoyment. I say that as someone who had to be re-introduced to eating and developing a taste for enjoying Brussels sprouts as an adult. 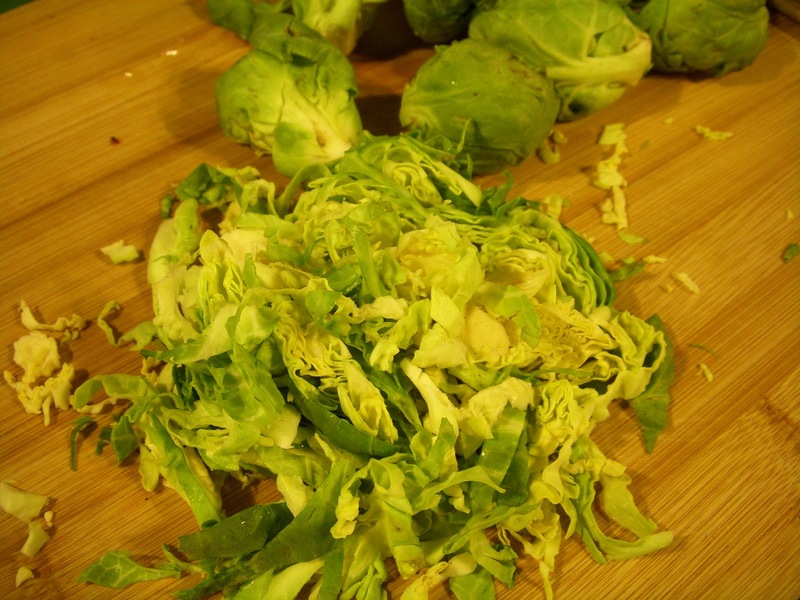 Brussels sprouts were one of those foods that I did not care for (hated!) as a child, and that memory and aversion just carried along into adulthood when I could make my own food selections. I can (sort of) admit now that my kind husband might have even (sort of) 'shamed' me into eating them after we got married. In any case, I love them now, cooked in milk or roasted, so I am happy to find a new way to use them. I don't know why I had never before thought of eating them raw or shredding them into a salad. 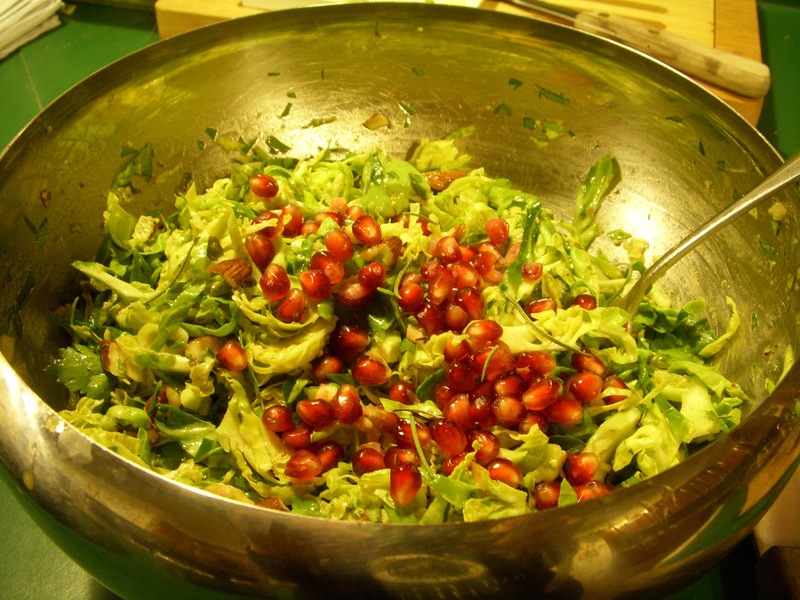 However here is the perfect way to combine those two thoughts for a delicious and beautiful Fall salad, thus, introducing Shredded Brussels Sprouts Salad! Lightly toss with a vinaigrette - I made a simple one with lemon juice, a bit of mustard, olive oil, and a touch of sweetener, which was just the best! This is more than enough dressing for the salad, so either save some for another salad or be ready to 'sop up' the dressing at the bottom of the salad bowl with some bread (yes - I do this). Other possible additions to this salad: diced avocado, sliced green onions, toasted chopped almonds seasoned with garlic powder, and on and on. 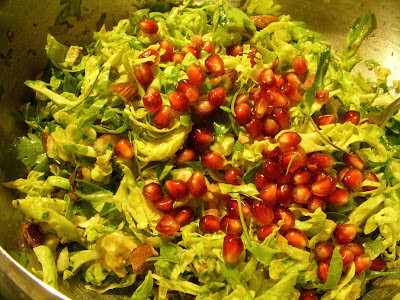 This salad is hefty enough to have many foods complement the taste and texture of the Brussels sprouts. Here are a few photos. Have fun - I hope you enjoy Brussels sprouts for the first time or in a new way. Brussels sprouts are healthy cousins of ultra-healthy kale. Throw in some kale, avocados, fresh herbs, almonds, olive oil and who knows what else. You then have a Fall salad that is chock-full of molecules that are considered biggies on the health-promoting list. 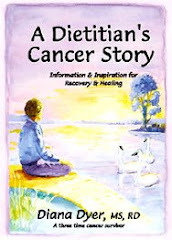 However, of course, a 'healthy' food is only healthy if you eat it, so it also MUST be delicious. You've got it here. This salad is delicious so enjoy it! Where kale (and Brussels sprouts) are way more than just decoration on my plate!